Bluebirds are medium-sized, mostly insectivorous or omnivorous birds in the thrush family. There are three species of bluebirds: Eastern, Western, and Mountain. Bluebirds are territorial and prefer open grassland with scattered trees. Bluebirds can typically produce between two and four broods during the spring and summer. Males identify potential nest sites and try to attract prospective female mates to those nesting sites with special behaviors that include singing and flapping wings, and then placing some material in a nesting box or cavity. 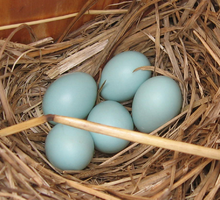 If the female accepts the male and the nesting site, she alone builds the nest and incubates the eggs. 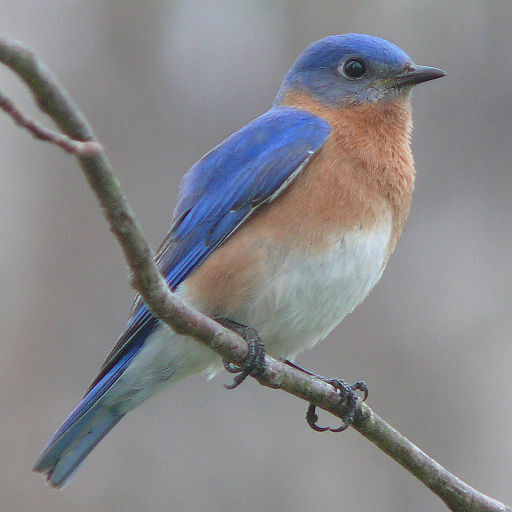 Of all the birds a gardener could choose to attract, the bluebird is the quintessential helpful garden bird because bluebirds are voracious insect consumers, quickly ridding a garden of insect pests. Jill Henderson writes for Show Me Oz, Feb. 26, 2013, that late February and early March are the best time to put out the welcome mat. Because bluebirds are primarily grassland birds that prefer natural cavities in which to nest, man-made boxes must be built to specific dimensions and hung in just the right location. 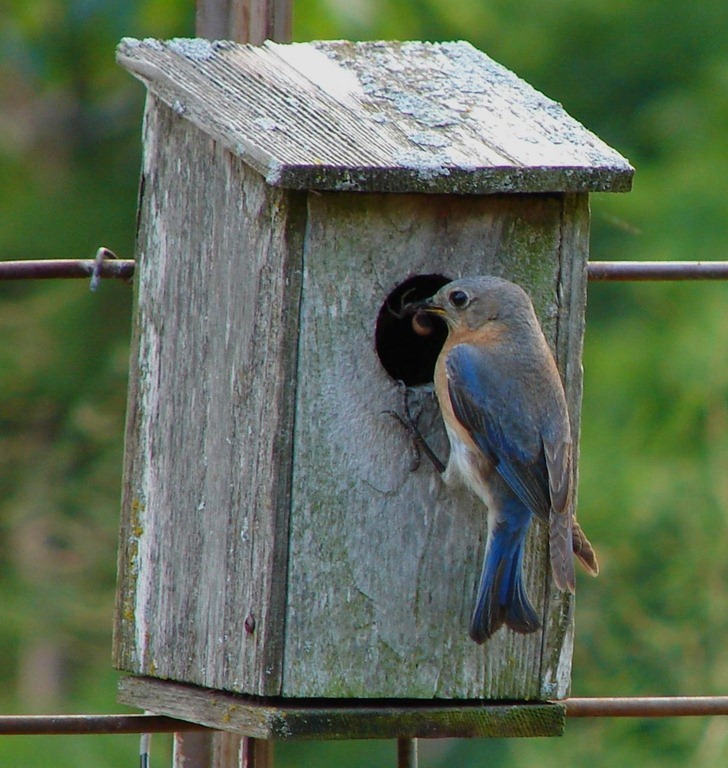 The North American Bluebird Society has a fantastic array of information on bluebirds, including several types of bluebird boxes that you can make at home. Many years ago, Henderson received her first bluebird box from her dad, which he made by hand using rustic recycled wood. And even though he specifically told her to hang it in an open area away from her heavily wooded front yard, she wanted to be able to watch the bluebirds from the kitchen window. So she hung the box where she could see it best. For two years she watched with hope as bluebirds inspected the box, occasionally going so far as to bring in dried grasses to build a nest. But every year the pair would suddenly abandon the project, leaving it available for errant woodpeckers, squirrels and the occasional pair of chickadees or titmice. Henderson finally conceded that the birds rejected the box because the location was just too wooded. Once she moved the box to the right location, the birds immediately began to nest. If you have bluebird boxes already in place, now is the time to clean them for the coming nesting season. Remove old nests and other debris, check the sturdiness of the box and be sure it is hung securely. For those wishing to attract bluebirds, build or buy a bluebird box and hang it in an open place with a mixture of open areas and trees for perching. Since bluebirds begin searching for nesting sites in late February and early March, time is of the essence. My dad has lots of birds visit in eastern Washington – including the blue bird, so pretty. Saw my first Cardinal today in Oklahoma – plus we’ve got Blackbirds that sing! And today one of my cats almost caught a Dove – but it managed to get free thankfully! Unusual bird that you don’t find in places where there are neatly trimmed lawns. I see them in the woods, mostly. Inhabiting dead trees. We rarely see them in our area, but it is always a delight to catch a glimpse of the beautiful red breasted blue bird. Thank you Dr. Eowyn for this beautiful creation post. Bluebirds are so lovely and productive as well.